Nothing is more relaxing than enjoying a lazy afternoon fishing from your kayak or paddling downstream to find some hidden, undisturbed fishing spot. Of course, solo fishing has its benefits. You can enjoy peace and quiet as you soak up your solitude, but there are plenty of reasons to bring your dog, too. In fact, there is no reason why you can’t bring your pooch along for a kayak adventure. So we decided to help those looking for the best kayak for dogs, or just any pet kayaks. Not enough room, you say? No worries. The list of kayaks below all provide plenty of room for you and your four-legged mate. This review guide highlights what you need to look for if you are searching for the best kayak for dogs. Now Fido doesn’t have to sit at home waiting anxiously by the door the next time you decide to hit the water for some fishing or paddling fun. Find an awesome pair of kayak shoes with our help list! Enjoy sun and surf with a friend or a furry companion with the kayak's three seating positions, which support solo, tandem, or tandem paddling with a child or pet. A pair of Comfort Plus seats provide four-way adjustability, generating a custom fit and greater slip prevention over molded seats. The open, sit-on-top hull makes it easy to get on and off the kayak and includes a pair of molded-in handles and skid plate. Maximum capacity of 425 pounds; measures 12 feet long and 34 inches wide. Lifetime warranty on the hull. Head out for an incredible day of fishing and paddling with the Ocean Malibu 12-Foot Kayak made for two. Two tandem seats provide enough room for you and another person. Also, there is plenty of room for either a child or a small to medium dog, meaning your beloved pet can come, too. The Ocean Malibu 12-Foot Kayak boasts a 4.6 out of a 5-star rating and is available to purchase for a modest price. Since it accommodates up to 425 pounds, you could easily fit two people and your pooch on this kayak without any worry. Overall, consumers seem relatively happy with this kayak. One individual left a positive review saying, “Great kayak. Easy handling.” Another commenter said, “This is my go-to kayak!” Considering the rating and the numerous positive reviews, this kayak is highly recommended for you and Fido, too. 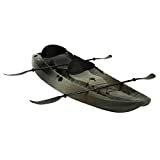 If you choose to purchase this particular watercraft, keep in mind that you will need to spend additional money to buy paddles. Also, it is important to note that a couple of consumers complained about possible issues with water leaking into the boat. There is also one customer who felt the color of the kayak did not match the image and description provided. Aside from that, the majority of customers had only good things to say about this kayak. If you are looking for a watercraft that purchasers seem to love, the Old Town Canoes & Kayaks Vapor 10 Recreational Kayak is the one for you. 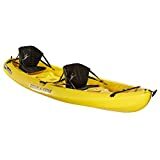 This hard shell style kayak has a sit-inside design that boasts a roomy cockpit that is just big enough for you and a small to medium sized dog. Your furry pal can sit comfortably between your legs while you paddle through the water and enjoy the day. Durability thanks to a single layer of polyethylene – it should last a lifetime. For the lowest purchase price out of these three kayaks, the Vapor 10 is relatively affordable. Just because it has a cheap price tag does not mean that it is of inferior quality. 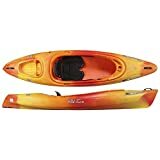 In fact, this kayak is so well loved for its style, durability, and features that it boasts 4.8 out of 5 stars. Customers all seem pleased with this kayak. One customer is quoted as saying, “Easy to use and maneuver. I love this boat of mine!” Another went on to say, “It tracks really well and for a good size guy it works really well for me.” Usually, there are at least some drawbacks with just about everything you can purchase, including kayaks. However, there are currently no real cons to report with this kayak. The Lifetime 10-foot Sport Fisher Tandem Kayak is an excellent choice for dog lovers like yourself. The sit-on-top design of this hard-sell watercraft offers plenty of room for you and your small to large sized dog. In fact, the kayak’s design provides enough space to seat up to 3 people and accommodates a weight capacity of 500 pounds. If you are not much of a people person, the extra room means you can accommodate a couple furry mates if you wish. All-in-all, the Lifetime 10-foot Sport Fisher Tandem Kayak offers incredible benefits, which is why it holds a 4.5 out of a 5-star rating. You can enjoy all of the features of this watercraft for a modest price. Despite some of the negative reviews regarding the drawbacks, the majority of customers seem thrilled with their purchase. Therefore, this kayak is highly recommended if you are looking for something that will comfortably accommodate both you and at least a dog or two. If you’re looking for the best kayak for dogs we hope the ones mentioned on this list will provide plenty of room for you and your pooch. Keep in mind that some kayaks offer more space than others, which means you will have to choose accordingly. Whereas the Lifetime 10-foot Sport Fisher Tandem Kayak can accommodate a larger dog, the Ocean Malibu 12-Foot Kayak will only provide enough room for a small to medium sized dog. Therefore, you will need to make your decision based on the size of your dog and your overall needs.